ntonio Yon brought a stack of folded notes to Tuesday night’s meeting. The San Francisco Municipal Transportation Agency was planning to vote on changes to the taxi industry, and that vote would have a major impact on Yon’s life. He’s a cab driver, and in his notes, he had written down what has happened to him since the rise of Uber and Lyft seven years ago. When Yon’s turn to speak came, he went up to a podium in the center of the room. The seven members of the SFMTA board sat above him in a semicircle on a raised platform. Behind him were rows of cab drivers who were in a similar position — workers who say they’ve been crushed in a "disrupted" industry. Yon shifted uncomfortably before he began speaking. He had just two minutes to tell his story. The clock was already ticking. Yon is one of hundreds of cab drivers who went to City Hall on Tuesday to protest. The SFMTA was considering three proposals: to decommission medallions from drivers who acquired them before 1978, to only let drivers who purchased $250,000 medallions after 2010 to pick up passengers at San Francisco International Airport and to allow corporations to buy medallions. Most of the drivers at the meeting opposed all three proposals. But the protest was about much more than that. 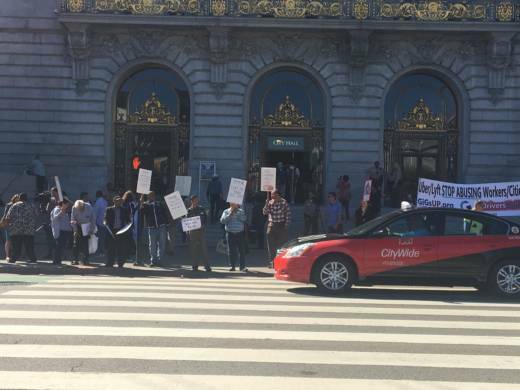 Since 2012, when companies like Uber and Lyft began operating in San Francisco without buying medallions, taxi drivers have come to protest at City Hall. They surround the building with their cabs. They honk. They carry signs. They go to meetings. Their demands have been fairly constant: for the city to regulate Uber and Lyft the way it regulates taxis. San Francisco had an opportunity to regulate Uber, Lyft and the now-defunct Sidecar when the companies started putting vehicles on the street in 2012. Cab drivers argued they were driving illegally, and they pushed for police to hand out tickets. They pointed out how Uber had actually launched the company with the name “Ubercab,” suggesting that it at first saw itself as a cab company. But the city chose to be hands off. It did not intervene in a service that consumers were quickly falling in love with. 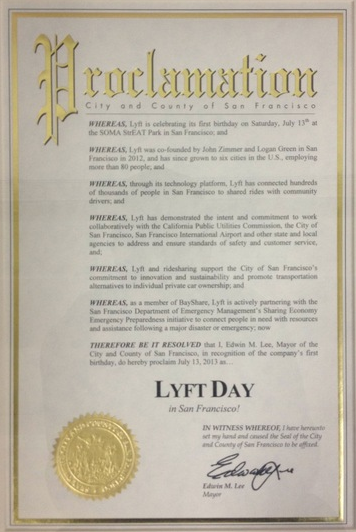 The late Mayor Ed Lee dedicated a day to Lyft in 2013. In the meantime, the California Public Utilities Commission began to assert its authority to regulate the companies as transportation carriers. The commission issued cease-and-desist letters to Uber, Lyft and Sidecar in 2012 and, when they refused to comply, issued citations against them. The CPUC's effort led to formal regulations adopted in July 2013 which dubbed Uber and Lyft as “Transportation Network Companies." This meant they would be held to a different set of rules and regulations than taxis. Because Uber and Lyft do not have to be locally licensed -- in San Francisco, that means drivers don't have to buy taxi medallions -- they have been able to put as many cars on the road as they like. Both companies quickly burned through venture capital to sign up drivers, keep fares low and gobble up as much market share as possible. Meanwhile, San Francisco was selling as many medallions as it could to taxi drivers in order to help make up transit budget deficits incurred during the 2008 financial crisis. The story since 2013 has been one of rapid decline for the taxi industry and the drivers who work in it. Their incomes have continued to plummet, putting emotional and physical stress on drivers. KQED recently interviewed the family of a Edward Agababian, a driver who died on the job from a torn aorta. His family believes his health troubles were a direct result of the stress and burden of carrying the debt of his medallion. The livelihoods and retirement plans of drivers like Agababian have been destroyed. The meltdown of the medallion system and the effect on drivers is what the taxi drivers came out Tuesday night to protest. Before the lengthy public comment period at the SFMTA meeting, Kate Toran, head of taxis and accessibility for the city, gave a presentation about the three proposals. To justify the measures, Toran referred often to a report released earlier this year to try to revitalize the city's taxi industry. Many of its proposals hinge on San Francisco's unique medallion structure. San Francisco has three kinds of medallions. There are the "Pre-K" medallions issued before 1978, which could be bought by any individual or corporation. After Proposition K passed in 1978, medallions could only be acquired by those who were driving 800 hours a year. They were awarded by seniority and drivers would sit on a waiting list for 10 or 15 years to get one. Then in 2010, the city "monetized" the medallions, selling them for $250,000 a piece. Toran said the proposals were geared to help the drivers hit hardest financially — those in the last category who have paid $250,000 for a medallion. The hope was that limiting the supply of cabs on the road and at the airport would increase revenue for the cab drivers who paid the most for their medallions. The SFMTA had held a meeting about a month prior to this one, in which cab drivers were asked for their input on some of these proposals. Toran said that a majority of the drivers at that meeting supported restricting which cabs could pick passengers up at the airport. Toran said leaving the status quo would be doing a disservice to the medallion holders. Over 150 drivers have already defaulted on their medallion loans. By the time Toran had completed her presentation, almost a hundred cab drivers had signed up to speak in the public comment period. When they got to the podium, they told stories of plummeting income. Of defaulting on loans. Of losing houses. Frequently the room erupted in applause. Cheryl Brinkman, chair of the SFMTA board, repeatedly told the audience to be quiet and threatened to clear the room. She asked the drivers to shake their hands in the air if they approved of what was being said. If they disapproved, they were asked to give a thumbs down. For the rest of the night, the cab drivers gestured in unison, moving their bodies so emphatically that they filled the room with the sound of squeaking chairs. Most of the drivers at the meeting wanted the SFMTA to reject the three proposed changes: to allow corporations to buy medallions, to decommission the "pre-K" medallions purchased before 1978, and to only allow those who have purchased medallions after 2010 to pick up passengers at the airport. Several cab drivers said that these proposals were not addressing the elephant in the room: the failure to regulate Uber and Lyft. Even drivers who might benefit from the city restricting the number of taxis at the airport, like Harbir Batth, were against the proposal. Batth is one of the more than 700 drivers who bought a medallion for $250,000. KQED interviewed him three years ago about his predicament. He is still in the same situation: paying a loan on a medallion that no one wants to buy. Most drivers at the meeting had a simple request: for the city to either find some way to regulate Uber and Lyft or to buy back their medallions. In the morning before the SFMTA meeting, five supervisors sent a letter to the MTA stating that they did not support restricting which cabs can pick up at the airport nor decommissioning medallions purchased before 1978. "In light of serious concerns raised by impacted stakeholders," the letter stated, "and the lack of analysis to inform the debate surrounding likely effects, [...] we cannot support at this time the staff proposals." The letter was signed by Supervisors Aaron Peskin, Rafael Mandelman, Sandra Lee Fewer, Norman Yee and Hillary Ronen. Mayor London Breed has been silent on this issue, and her office has not responded to multiple requests for comment. Despite the letter from supervisors and complaints from cab drivers, the SFMTA board decided to pass the proposals that would allow corporations to buy medallions and to limit which drivers could pick passengers up at the airport. Drivers were livid. Several said that this is the final blow and that the taxi industry is now officially dead. It is not clear how this policy will be enforced. Drivers with medallions acquired before 2010 will still be able to drop off passengers at the airport, but then they will have to leave without picking anyone up. Drivers said that it is not worth driving at all if they can’t go to the airport. Already, many medallions are not out on the road -- a 2017 San Francisco County Transportation Authority analysis concluded that even at the busiest times, about 400 to 500 taxis are on the streets compared to as many as 6,500 Uber and Lyft vehicles. It's unclear what this new proposal will do to the fleet or the number of cabs on the street. The fewer drivers on the street, the fewer workers there would be to collectively push for reforms in the industry. It is also unclear what effect it will have on drivers who can still pick passengers up at the airport. The SFMTA's report on revitalizing the industry forecasts they will see an uptick in their earnings. But with the ever-changing situation with Lyft and Uber, certainty has become a rare thing in the industry. It was fairly early in the night when cab driver Antonio Yon got the chance to speak. He spoke quietly and gripped the edges of the podium. "There was no business out there for me," Yon said. Yon had a mortgage, but in recent years he said he couldn’t make the payments. "I was getting lots of nasty calls from the bank,” he said. Yon just wasn’t earning enough money on the road to keep his house. Yon said he's homeless now. The only reason he isn’t on the street is because he found a tiny place in Chinatown to stay in temporarily. Yon’s voice began to break as he got to this point in the story. “I was very desperate. I was about to commit suicide,” he said. The entire room was silent. Yon took a few seconds to compose himself. He was starting to talk about what he wanted from the SFMTA. An electric bell sounded. His time was up. "I have to survive," was the last thing he said. Yon gathered his papers and walked straight to the back of the room. Another driver, Inder Jitghotra, stood up and touched Yon’s shoulder. Jitghotra’s family owns six medallions and is on the edge of bankruptcy. Yon stood very still, clutching his notes. He stared straight ahead as another driver walked up to the podium to tell his story.